A Woman Mistakenly Showed Up For Her Interview With Microsoft A Month Early. Her Hilarious Exchange With The Company Has Gone Viral. "I quite frankly wanted to disappear into thin air." Laura MacLean is a 21-year-old Scottish student studying management and marketing at Robert Gordon University in the UK. Next month, MacLean has an interview with Microsoft's University Recruitment team that offers students a chance to work for a full year with the company. The interview is scheduled for Feb. 18, 2019. MacLean told BuzzFeed News she is very eager to get the job. "I pride myself in being very prepared and an organized person," she said. So on the day of the scheduled Skype interview — or at least it was the day in her mind — she was more than prepped. She said she'd been "studying everything [she] could about" the company, and had even asked her parents, siblings, and friends to hold mock interviews with her days leading up to the anticipated interview. "I didn’t want to mess up my one chance ... and these types of chances don’t come around often with big tech companies like Microsoft," MacLean added. One day this month, MacLean woke up extra early and was ready to take this scheduled interview on. Again, her interview was scheduled for Feb. 18. MacLean said she woke up hours early so that she could have a full breakfast, "change into [her] smart clothes," have her hair and makeup done, and squeeze in "extra prep and research for the interview." When 11 a.m. came around, she anxiously waited in front of her laptop, ready for the interview of her lifetime. When it became 11:15, "panic set in," she said. She worried her internet connection might have been faulty, so she decided to email the recruitment team to make sure everything was in working order. 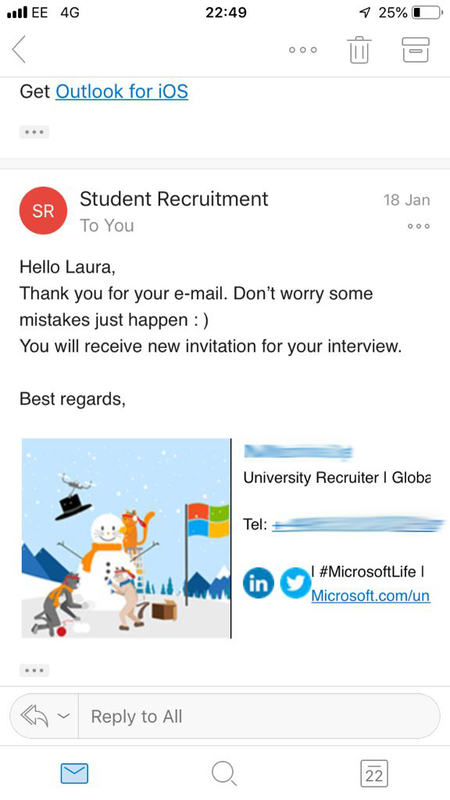 A representative on the Microsoft University Recruitment team responded to her email, stating their interview was set for Feb. 18. To whom MacLean responded, saying it was Feb. 18. The recruiter politely responded thanking her for her email before telling her no...it was not Feb. 18. It was Jan. 18. "What made it all worse was that my birthday is the 14th of February, so somehow I had managed to skip turning 22," MacLean joked. 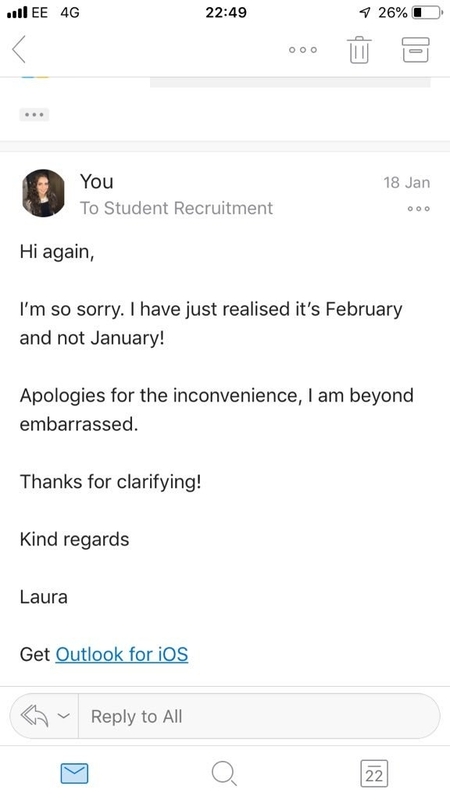 "When the team emailed back reminding me it was in fact January and February was the next month, I quite frankly wanted to disappear into thin air," she said. MacLean added that she accepted that she had sabotaged her opportunity entirely "as I thought Microsoft would think I am an idiot." When she shared the email exchanges with Microsoft on social media, it went viral. People were creatively and hilariously trying to turn a cringeworthy moment into something positive. Some suggested she respond saying she showed up so far in advance — a whole month ahead — because of her "intense dedication to punctuality." And if she were asked what her "greatest weakness" is, she could say "being late for things" — and it's proven true! @ozzieoneill @lauramacleann @rchlcrns "What would you say is your greatest weakness?" "I really hate being late for things"
Or, something to stroke Microsoft's ego. "Just reply, thatl teach me for trusting a bloody macbook," one person joked. A surprising amount of people admitted that they'd done something similar in the past. One person said they took a whole flight to the interview on the wrong date. MacLean said she's extra grateful for the kind messages and those brave enough to share their experiences. "It’s lifted my spirits knowing I’m not alone," she said. If you're left wondering, MacLean apologized to the recruiter, and the recruiter handled it quite nicely. "Don't worry some mistakes just happen :)" they said. MacLean said she's feeling "a mixture of emotions" heading into the actual interview date. "I’m a little nervous, but at the end of the day, we are all human and I’ve heard from people all over the world who have commented on my tweet that they’ve made this mistake before too, which is a great consolation," she said. "Hopefully, Microsoft will see the humorous side to this whole mix-up." Don't worry, it seems the company has no hard feelings. Chuck Edward, head of Global Talent Acquisition at Microsoft, told BuzzFeed News that Microsoft is "always looking for candidates who have a growth mindset." "And that means taking initiative, leaning into uncertainty, looking for solutions and recognizing our own mistakes," he said. "We wish Laura the best of luck on her interview on February 18th."